How to maintain your focus and manage interruptions. The biggest reason for the inability to focus on the task at hand is the lack of concentration. This can happen to the best of us. The one scenario told to me about the lack of concentration on a given task goes like this. A farmer told his wife he planned to plow the North field the next day. In the morning he went out to oil the tractor, but he found he was low in oil. He went to the storage shed to get some for the tractor. On the way he noticed that the chickens had not been fed, so he went to the corn crib to get some corn to feed them. While getting the corn, he noticed some sacks on the ground. This reminded him that the potatoes needed sprouting. He started toward the potato pit to sprout the potatoes, but on the way he passed the wood pile. This reminded him that he had to take kindling to the house. As he had picked up a few sticks he saw an ailing lamb passing by. He dropped the wood and reached for the lamb. He then took the lamb back to the farm where he could treat it's wounds. 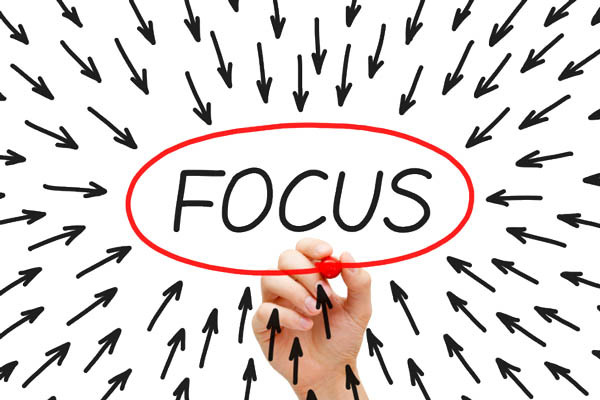 Focus is very important and you can gain your focus by removing all distractions and deal efficiently with and and all interruptions. After all, these interruptions are no more than someone else that is controlling your time, and interruptions are the enemy of your focus. Interruptions can delay your current work and this is also a bad as returning to your prior work can lead to errors. The correction of these errors are time consuming and take up more time than the original task itself. Distractions come in all forms. Co-workers, clients, items on your desk can all be a form of distraction. Keeping your desk clean can eliminate one form of distraction. Also, everyone has their own peak time for mental and physical activity. Once you have discovered your peak time, you can schedule your tasks for that time. When an administrator says, "I keep getting bothered by users. ", it is really meant that they have a failure to maintain focus on their project or task. As said before, interruptions are the enemy of focus, it is the nature of the job and for and administrator it is a fact of life. Focusing is the job of dedicating as much of your brain as possible to the task at hand. When you attempt to focus, you are trying to dedicate 100% of your brain, or the frontal cortex anyway. Unfortunately, your brain can be cluttered with many thoughts ranging from something that was said to you earlier in the day to your shopping list at the grocery store that you plan to visit on your way home. To focus, you need to clear out all of those thoughts that you need to remember. Place those thoughts to other media in order to help you remember later; right now, focus on your task and your task only. File the things that can be filed. Take the unfinished items and put them in a stack to be completed soon. Put all the remaining things in a large envelope and mark it, "If I haven't opened this in three months from this date, throw it out." Make sure you seal and date the envelope and follow up on your disposal plans after three months. As said before, humans are not, by nature, efficient multitaskers, however we try. Unfortunately, an administrator's job is one where multitasking is the norm. The trick is just how to multi-task. For instance, let's say you have a task that is going to take an hour to perform and can be done without your intervention. Rather than just sit there waiting for the task to complete and wasting an hour waiting, start another task in the meantime. Be aware of when and when not to multi-task. The best tasks for multitasking are the "hurry up and wait" tasks. These are the ones like having to download a large file, compiling a program or performing a large backup. These tasks don't need your immediate attention so you can go accomplish other tasks while these tasks complete. Keep your stress and sleep levels in check. 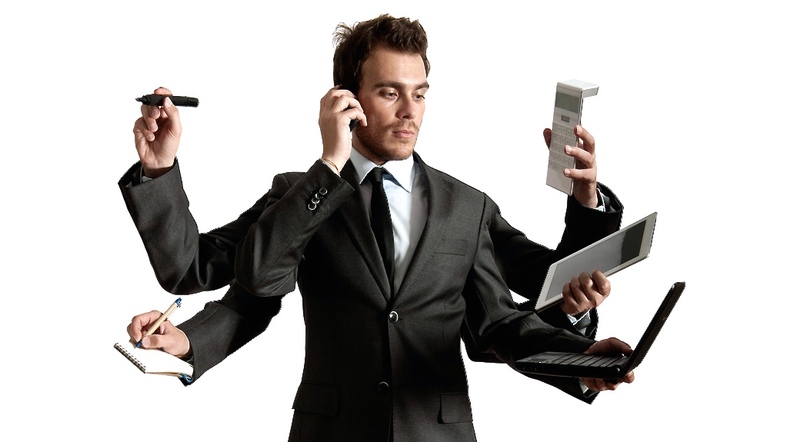 Being tired or under a lot of stress is the receipt for disaster if you try to multi-task. The best advice is that the more stress you have and the less sleep you have been getting, multi-task less. Organize your Window's environment. I am not talking about the window to your office of course, I am speaking of your Windows desktop. Try using multiple monitors. Most people now days have at least two monitors and in some case more depending on their duties. Having multiple monitors help keep the important screens such as email, network monitoring software etc. easily readable without having to close multiple windows to get to it. Another important thing about this is to be consistent with where each window is placed. If you get used to a particular arrangement, you will naturally look toward the direction needed for that particular window. Usually the first hour of the workday is the quietest. This is when there are fewer, if any, interruptions. If you can get yourself into the office an hour early then you should be able to focus on tasks and projects. Most of the time you will find that you can get more done in this first hour than you can the rest of the day. Even if you seem to get shot out of a cannon the moment you come into work at your normal time, coming in a bit earlier will help you clear your plate. It can't be said enough when it is said that interruptions are the enemies of focus. The trick is being able to manage your interruptions and not let the interruptions manage you. If you are interruption driven, this means that you will attack the tasks as soon as they arrive as opposed to either prioritizing or delegating these tasks to others for completion. Sure, there will be interruptions in the form of employees and users stopping by to ask questions and such, but these interruptions can be easily handled without much loss of focus. When we are interruption driven, we allow the interruptions to manage us rather than vice versa. One of the most irritating interruptions is when someone comes to you with a question or problem when they should be contacting someone else. Sometimes your gut reaction is to tell them to go away, but remember that not only is this rude, it is completely non professional. If you find that someone has come to you by mistake with a question or problem, simply re-direct them to the correct person or department for their problem. Until you make it clear as to who the best person to go to for their problem, you really can't get mad at these people if they aren't going to the right person and come to you. The first thing to do in this case is to acknowledge their request in a respectful manner. What we must do is to know what our users expect from us. It is a fundamental aspect that most people will be satisfied if they feel that their concerns are acknowledged. You don't have to fix their problem, just acknowledge that they have a problem. If a user submits a ticket, they don't want to be made to feel that once submitted, the ticket has ended up going into the void of a black hole never to be seen again. No response about their problem keeps the user in unfair suspense. Acknowledge the user's problem, communicate with them that it is being addressed and most importantly, keep that line off communication open even after the problem is resolved. Check on them and to make sure all is well. This not only will help you and your credibility, but in the beginning of their problem will be a polite way to tell them to "go away." On a final note about interruptions, they will happen. There are three things that can be done when someone interrupts you with a problem. These are Delegate it, Record it, or Do it. Delegate it to someone else if someone else can handle the problem. Record it by creating a ticket if the issue is not an emergency. Make sure your user knows you have created a ticket in behalf of them for their request. Do it if it is an urgent matter.